As the BBMP elections are slated to be held by the end of the year, this new website, set up by Zoomin Softech Pvt Ltd, an IT solutions company, for State Election Commission (SEC), will help you search for your name on the voters list. But this is only if you voted for the parliamentary elections earlier this year. Citizens who have registered during the past few months after the Lok Sabha polls will not find their names on this site, since these updates have not yet been published online. The homepage of the site has both English and Kannada, with the dropdown menus in English. The ‘Search By’ icon has different options through which you can search for your name on the electoral list. Click on ‘Name’ and you will get a page where you are required to fill in your Assembly Constituency (AC) and name. Even though it isn’t starred, enter your gender to narrow down your search. Note that the ACs are not listed in numerical order. While entering your name, type in a part of the name instead of your full name, say the first four letters or so and search. While entering your name, type in a part of the name instead of your full name, say the first four letters or so and search. You could also enter your surname to search. Be wary of wrong spellings in the database because of which your name may not show up on the search results. The search result shows the name of voters, the new wards they belong to, their new voter roll part numbers, serial numbers, house numbers, father/husband’s name, age, gender and EPIC (electoral photo identity card) numbers if they have one. If you click on the row where your name appears, the polling station details will open in a new window. The ‘Search By’ option also allows you to search for your name through EPIC number or Ward. The procedure is similar as mentioned above. The Voters List (PDF) option says the electoral rolls will be available shortly. Here’s all the information that you need about Maruthi Seva Nagar ward prior to the BBMP elections: What has happened in the ward in the past five years, who is contesting, what are the problems? 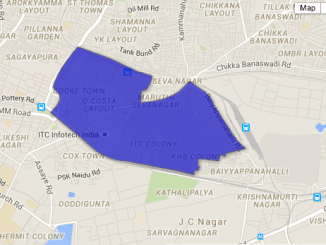 In bangalore city i have a godown in prakashnagar,bangalore-560021 in iappa temple road. i left the godown on may 2004.But advance balance amount 40000/- not received till date godown owner mr. Pradeep contact no.9916591697 and contected to vice chanceler pamavati.he has not refund my amount.please help me same way to recover the said amount. The BBMP websites are badly designed..they are not user friendly and seems like they like to sponsor Microsoft, their websites work well only with Internet explorer. I struggled to pay my property taxes and print my receipt online using google chrome..on a vague suspicion, I changed to IE and could get in! same happened with this list too. Prakash nagar, bangalore-560021 he is in 77, Rajajinagar assembly contituency but this not tress out and not change ration card.At present i am active member of karnatka pradesh congress committee and trying to join all india congress committee. kindly tressout the same and inform me by mail or mobile. Good to see SEC going online. But great difficulty is that most of our names are incorrectly spelled in their database which makes the search a painful process. Hope they will try doing something to fix that as well.